I’m not calling myself a high-maintanence traveler (necessarily), but I will say I’m a woman who likes to have all my essential makeup items with me “just in case.” Of course my husband would argue he couldn’t possibly see a situation where a smoky eye emergency would hit (not like he would actually use those words. It would be more like, “You’re kidding right? 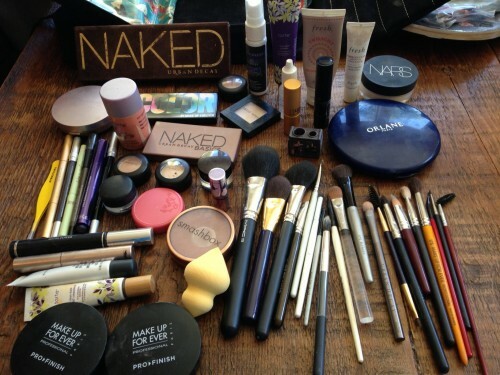 There’s no way you’re going to use all that makeup over three days.”) Whatever. I like having choices. If Rachel Zoe can bring 7 huge suitcases for a week in NYC because she likes to keep her options open, I can rationalize bringing 50 different makeup items for the same reason. Now up until now my makeup bags have stifled me — forcing me to make hard decisions between palettes and products — finding that as soon as I unpacked I forgot essentials and made bad decisions. 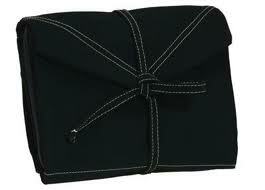 It was a constant battle… And then I was introduced to the Hold Me Bag ($85.00) and I was finally freed from my shackles. Now I know $85.00 sounds like a lot but it’s one of those investments you’ll never have to make again. Not only can I pack every makeup brush but the main compartment has a generous side pocket so I can bring all my palettes! And I have to say as someone whose constantly made the mistake of investing in makeup bags with compartments that there’s something liberating about easily being able to have all my products in one main section. 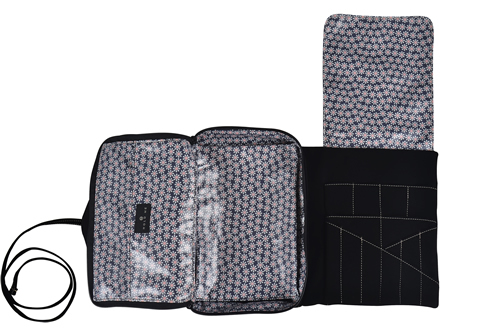 Let’s face it — you buy those makeup bags with compartments so you can “get organized” but you never end up putting the products back in their original place. 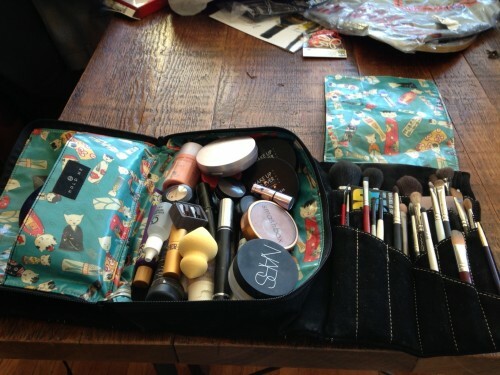 And, the compartments take up so much space diving the bag that you can only get a fraction of products in a large makeup bag. Drove me crazy! So below you can see my chaos I bring on every trip these days and how the Hold Me bag does in fact hold it all! Voila! Everything fits and is super easy to find. A few other things to note: The bag comes in several adorable patterns. Of course I chose the cute little Endochine Kitten Dolls because I’m a huge cat lover. All the bags have black “Knew Suede” exteriors because it’s super easy to clean (which I have tested and proven several times because I’m a slob) and tie up into a flat, easily packable package. One more thing! The one I bought is full-size (10″H x 7″W x 2″D closed) but they also offer an adorable Baby Hold Me (7″H x 5″W x 2″D closed) in all the same cute patterns!